I'm consider a suspension overhaul - but I know at some point a rolling year+ away, I need a respray. Is there any point doing the suspension when a respray is on the cards next? Shouldn't I do it the other way round - paint then suspension? Suspension first. Don't want any damage to the paint fitting the new suspension or gravel rash testing the 'new' handling out. Good answer - like that logic! I agree, that is how I am doing it on my 996 C4. Except that whilst all of the suspension is off I am sorting out the underseal on the arches as the access is better. Finishing touches should always be left till the end. That would be the next question. No intention of focusing on track, just fast road. Was going to listen to advice here and from the usual Illuminati-Approved Purveyor of Suspension Parts and Unicorn Horns! Or maybe just CoG. Had mine done by CG in 2016 and after much research and many chats with Chris & Peter I decided on Bilstein B8's with Eibach Pro (progressive) Spring Kit. My car is running RS ride height and i'd class the ride as firm, almost as firm as my previous 996GT2. Corners very flat and is really impressive and planted on the Yorkshire A & B roads where it thrives. It occasionally hits the plastic brake ducts when really pushing on over crests etc. but nothing i'm worried about. Obviously not for everyone as some prefer a softer ride but suits my needs perfectly. Suspension wise I think it comes down to the roads you mainly drive on .... that’s how I decided what I wanted. So I went M033 and Koni FSDs for our underlating and crappy A & B roads. I think this set up absolutely perfect for the vast majority of the U.K minor and back roads and can drive very quickly indeed without the car trying to either bounce me or veer me into the nearest ditch. Compliance is the magical word here. I’m also a biker so not one for holding back where the conditions allow. I did replace every other suspension part at the same time though. If I lived in somewhere like Spain though with their (mostly) beautiful smooth roads or maybe tracked the old girl, then the combo I have would be a little soft imo. As I’m poor and have little chance of heading to Spain full time...... what I’ve got works just great. Toby I have sen you car many times...why do you need a respray? It looks in amazing condition. I also went for M033’s and KONI’s .. no regrets, happy as a clam. Thanks go to Kimbo and the amazing amount of “on the job” research he did with many different types of suspension before settling on the above. Thanks J! Yes, it passes the 10 foot test, but isn't so good on the 10" test in a couple of places - but certainly not an urgent issue, hence favouring doing suspension first! Talking of which, booked into CG for a check-up early Oct. I just waited a little longer and got it all done at the same time. Yesterday I visited Centre of Gravity and spent the best part of three hours chatting with Chris and reviewing the specifics of my car. First we went out for a drive and spent +half an hour reviewing how it behaved - this confirmed there are a few minor issues but nothing apparently terrible. A knock or two - of which I was aware - and less than perfect handling, again expected - that's why I was there! Back to the garage onto the shock-absorber test. The (oscilloscope-like images below) showed my shocks operating normally. 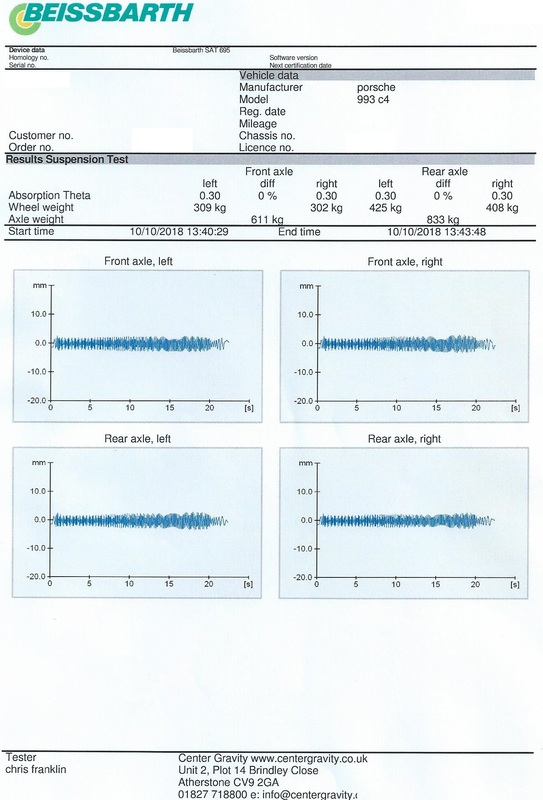 Next, up on the lift and an alignment test (cartoon-wheel image below). This showed my wheels all pointing in different directions! 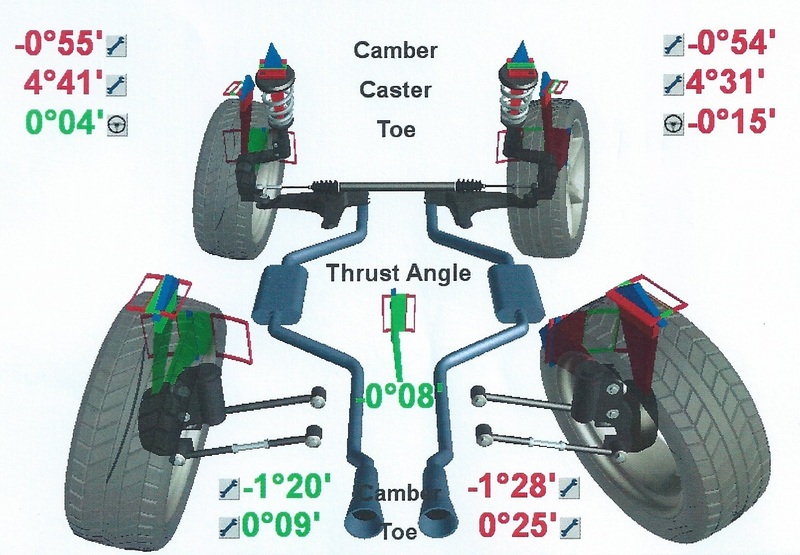 Then a thorough - and I mean thorough - review of the suspension components. This delivered good news. I have factory-original Boge shocks in very good condition and in no need of replacement (apparently if I want to upset people I can point out that Monroe shocks of the time would probably be on the way out by now, so I'm lucky to have Boge). It also showed that my suspension has been well maintained with lots of new parts fairly recently (2011-and-after year code on many parts - not done that many miles since then) and all bar a couple of bushes replaced - these need doing. Finally - as the next client hadn't arrived, he fixed the tracking issues for me - so my wheels all point forward now! I have a huge check list of every suspension part and its status. Turns out I am running a ride height half way between factory and RS with a high-ish rake. With the alignment and rake it is configured for track use, Chris said. I will probably take it back to Chris to change the couple of bushes required and do a full alignment set-up that is less aggressive (ie road use, not track). I know this level of attention is not to everyone's taste, but for a couple of hundred, it was a fascinating afternoon to find out exactly what's going on with my suspension. If you are curious, go for it. Nice one! These cars handle so much better with even small tweaks to geometry. Next time you go to CG, have a chat about whether welded tie rods would be a benefit to you. It's a small but noticeable difference to the steering's responsiveness. Agreed, my car handled like a pig, and tram-lined very badly before Chris and Pete worked their magic. I think the 993 is very sensitive to minor adjustments and whole kinematic thing!! Chris welded my tie rods, hard to notice the difference as it wasn't done in isolation, but car is well planted now. A new set of boots made a massive difference to the tram-lining also, as my car is low mileage, the tyres were hard and out of date and aggravated the situation. Ditto worth every penny at CoG. You learn a lot too. Biggest transformation was the 944 which went down the straight like a crab before. I tried to get a Geo done before I had a track day at Silverstone but all the places were booked up! I did track day and car was ropey on straights but great round the corners.. Still tried to get geo for my nxt track day at Brands but.... all booked up.. in desperation I took it to my local Phillips Tyers garage.. they had not ever done a geo on a Porsche... 1hr later and £60 I had a RS geo.. tow, ride heigh, camber.. I was SERIOUSLY impressed..
Brands hatch the car was like a new car, on rails. I suspect of you have the correct equipment and can find the right numbers on the web, it shouldn't be too hard for a competent mechanic. Great to hear it was improved!